Over the last 20 years, the Kazakhs of Bayan-Ölgiy, a Western province of Mongolia, have joined several migratory flows towards Kazakhstan. More than one million Kazakhs of the diaspora, known as “oralman” or returnees, have migrated to Kazakhstan. The Kazakh returnees of Mongolia suffer from a bad image and from a low russianization, both favored by their isolation in Mongolia where they kept speaking Kazakh and observing Kazakh traditions. In Kazakhstan, Mongolian oralmans form the second population of repatriates, after the Uzbeks. They represent approximately 15% of all oralmans. In 2013, on the eve of the Mongolian presidential elections, more than 7000 oralmans, "returnees", asked to become Mongolian citizens again. In this tense political context, the holiday of Nauryz constituted a moment of recognition for the Mongolian-Kazakhs, for those who live in Kazakhstan, for those who did not migrate there, as well as for those who returned in Mongolia because they had not succeeded in adapting to Kazakhstan. Corresponding to Persian Nooruz, Nauryz is a total social fact for the Kazakhs, regardless of their citizenship, which intensifies the differences between the national contextes of the place they live. Through the narratives of two families, this film paints a picture of a little known people that has become divided between their native country and their ancestral land. The Kazakh living in the western border region of Mongolia have since the early 1990s lived through a post-socialist reconstruction that is distinctively Mongolian, and at the same time they are increasingly orienting themselves towards Kazakhstan. The film alternates between illustrated interviews and footage of the sharing of the New Year’s celebration of Nauryz with these same two families. 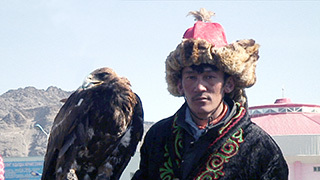 In so doing, the film reveals the transnational nature of this community at the heart of Central Asia.